On Feb. 13, Jackson Jhin of Chicago Ventures hosted “Venture Capital Secrets and How to Evaluate Startup Ideas.” The event was the third in this semester’s Robert K. Wilmouth Speaker Series, a number of lectures hosted by NDIGI designed to further students’ knowledge of the science and art of investing. The objective of the event was explain venture capital, to expel some of the myths surrounding the field, and to teach students how to evaluate startups as potential investments. Jhin graduated from Notre Dame in 2017 and has worked as an analyst for Chicago Ventures since June of that year. There, he assesses startup ideas and aids current portfolio companies. 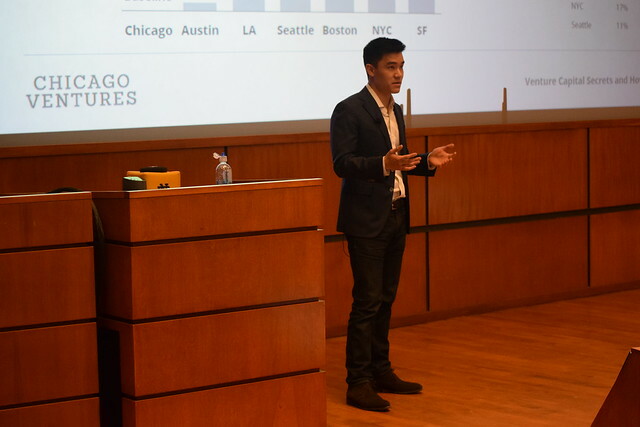 While at Notre Dame, Jhin was on a team of students who competed and won the 2017 Venture Capital Investment Competition (VCIC), an event that allows students to play the role of venture capitalists and choose the right investment fit from among several startups. Today, he coaches the undergraduate and graduate Notre Dame students participating in VCIC. He also served as the co-founder and CEO of Float Tickets, a peer-to-peer ticket exchange insurance app. Venture capital is a form of private equity. It refers to capital that investors provide to new companies that have the potential for long term growth. In exchange for this capital, companies will create large ownership pieces to sell to investors. Typically, venture capital firms will focus on startups in the first rounds of investing, while other types of private equity firms will focus on more established companies. Most venture capital firms will take an active role in managing their investment, aiding the company as it expands. Typically, after a period of four to six years, the company will exit the firm. Jhin stated that many startup companies believe that the best way to grow their business is through getting financing from a venture capital firm. These companies cannot get bank loans because, as new emerging businesses, they have neither cash flow nor collateral. The notion that startups and venture capital are inherently compatible, Jhin explained, is incorrect. There is a hypothetical venture capital firm with a $50 million fund. As most firms do, it looks for an internal rate of return (IRR) of 10% to 30%. Realistically, it expects an IRR of approximately 15%, or, $150 million. This firm will invest its $50 million fund in 50 companies. On average, Jhin stated, 45 of these companies will fail. This means that just five companies will have to provide the firm $150 million. Each company, therefore, will need to produce $30 million in returns. Most startups simply do not have this potential. Jhin continued on to discuss how he and his company evaluate startups as potential investment opportunities. He stated that it is best to put nomenclature aside and simply ask how many dollars a company is raising. The key to all of venture capital, he explained, is a company’s ability to meet venture scale, or the company’s ability to grow quickly and capture its total addressable market (TAM). If a company cannot meet venture scale, he said, it is not a good investment for his firm. He then performed an exercise in which he proposed several prospective ideas for new companies, and asked the audience to assess them. After going through each idea and explaining why it was or was not a good potential investment, he gave prizes to the audience members with the most correct responses. Jhin has long been interested in, and now specializes in, technology startups. He therefore has developed his own personal strategies for finding new apps or companies and deciding how to appraise them. He shared those tips, and his tips for learning more about venture capital, with the audience. Jhin said that when he first became interested in technology and venture capital, he unfollowed most other news aggregators on his Facebook page, and followed three blogs: TechCrunch, VentureBeat, and MIT Tech Review. Doing so moved these publications to the forefront of his social media experiences, and allowed him to stay up-to-date on tech news. He recommended the “Invest like the Best” podcast and the “Sam Altman” YouTube Channel. With all these options, said Jhin, “anyone interested in the industry can create their own curriculum” that will enable them to launch into venture capital and learn to spot the best technology startups.